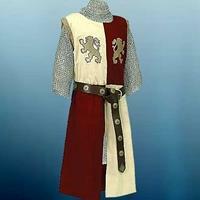 This beautiful Lionheart Crusades Tunc is heavy, 100% cotton weave, with alternating panels of ivory and deep red, and Richard the Lionheart's trademark rampant lions in stunning gold and black embrodery on the chest. Arm-holes are also trimmed in gold braid. Wear with our Faux Chainmail Tunic and Coif (sold separately) and a Medieval longbelt for an authentic Knight of the Crusades look. Sizes S/M or L/XL (see size chart below). Dry clean only. (belt and chainmail pictured not included). NOTE: Size S/M is ideal for people 5'6" to 5'11" tall. If 6' or over, order the L/XL size.